Switch on the compressor and let it run for approximately 3 minutes to fill the sealant. 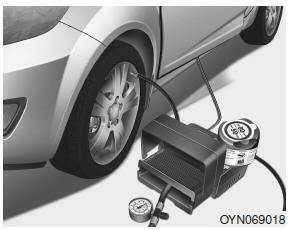 The inflation pressure of the tire after filling is unimportant. Do not exceed a speed of 35 mph (60 km/h). If possible, do not fall below a speed of 12 mph (20 km/h).